Goodman is the director of Thy Kingdom Come Ministries in Tulsa, Oklahoma, a Bible prophecy ministry founded by Dr. Charles Pack. He and Dr. Pack co-host a television program called "Prophecy Watch." Like his mentor, Dr. Pack, Phillip Goodman is an astute Bible student and gifted teacher who bases all that he writes and says on Scripture. Next, he narrows the geographical search by pointing to Micah 5:5 where an end time prophecy refers to "the Assyrian" invading the land of Israel. He argues this is a reference to the Antichrist. He then buttresses his argument by referencing Daniel 8 where Daniel tells about a vision he was given of a succession of empires. Daniel says he saw a ram representing the Medo-Persian Empire (vs. 3 and 20) and that it was trampled by a male goat, representing the Greek Empire (vs. 5-7 and 21). The male goat had a "conspicuous horn between his eyes" representing Alexander the Great. But then Daniel reports that he saw the large horn "broken" (symbolizing the death of Alexander) and that "in its place there came up four conspicuous horns," representing the four divisions of the Greek Empire that were created after Alexander's death. Out of one of those four divisions of Alexander's Empire Daniel witnessed the emergence of "a little horn which grew exceedingly great" (verse 9). Nearly all Bible scholars agree that this little horn represents Antiochus Epiphanes, a tyrant who arose out of the Seleucid section of Alexander's Empire. He is described in detail in verses 23-26 in what sounds like a classic depiction of the Antichrist, making it clear that Antiochus was a type of the Antichrist. In fact, this is made rather clear in verses 17 and 19 where Daniel is told by Gabriel that the prophecy will not find its fulfillment until the "time of the end." 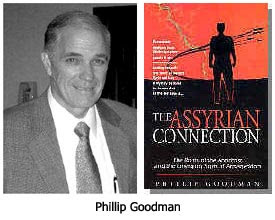 Another argument Goodman uses to substantiate the Assyrian connection of the Antichrist is based on a passage in Revelation 17:9-11 where there is a reference to seven empires. Five are referred to as "fallen" (Egypt, Assyria, Babylon, Medo-Persia, and Greece). The sixth is "the one that is" — namely, the one that existed at that time (Rome). The seventh is called the one that "has not yet come" (the empire that will give birth to the Antichrist). Revelation 13:1-3 also refers to these seven empires and states that the Antichrist will arise out of the one that comes back to life in the end times. The traditional interpretation is that this is a reference to a revival of the Roman Empire. But Goodman says no. He argues that all the kingdoms continued to exist to one degree or another except the Assyrian. He argues it was the only one that totally ceased to exist and therefore, it is the one that will be resurrected from the dead in the end times. To support this conclusion from Scripture, Goodman quotes Daniel 7:12 where Daniel is told that "an extension of life" for "an appointed time" had been granted to the beasts that were symbolic of world empires. Goodman offers a number of other arguments in behalf of his thesis, but these are the key ones. Let's now evaluate them. Regarding Daniel 8, there is no doubt that this chapter is a prophecy that Antiochus Epiphanes, who is a biblical type of the Antichrist, will rise out of one of the four divisions of Alexander's Empire that were created after his death. It is also clear that the chapter states that what is said about the nature of Antiochus applies to the Antichrist in the end times (Daniel 8:17 and 19). But the primary focus of the chapter is on the personality and character of the Antichrist (verses 23-26), not on his origin. Keep in mind that there are many other symbolic types of the Antichrist in Scripture besides Antiochus. They include such persons as the Pharaoh of the Exodus, King Saul of Israel, David's son, Absalom, and King Herod. Some of these are Jewish, but that doesn't mean the Antichrist will be Jewish. One of the most significant, the Pharaoh of the Exodus, was from Egypt, but that doesn't mean the Antichrist will be an Egyptian. The weakest argument Goodman attempts to use is the one he bases on Revelation 17:9-11. His assertion that all the empires included in this passage have continued to this day, except the Assyrian, simply cannot be justified in history. The Babylonian Empire ceased to exist overnight when it was overthrown by the Medo-Persian Empire. Two hundred years later, when Alexander the Great visited the site of the Empire's capital city, there was nothing left but ruins. The Bible specifically prophesies that Babylon will be overthrown by the Medes, and that thereafter, it will "never be inhabited or lived in from generation to generation" (Isaiah 13:17-20). That prophecy was partially fulfilled in 539 BC when the Medes and the Persians conquered Babylon. It was completely fulfilled in the years that followed as the city went into a slow decline, ultimately ending up in ruins. And just as prophesied, the city has remained desolate to this day (despite persistent rumors of it being "rebuilt"). The bottom line is that there is no way around the fact that the Egyptian, Assyrian, Babylonian, Medo-Persian, and Roman Empires ceased to exist. And there is no way to sensibly argue that all of them have continued to this day except the Assyrian, and therefore it is the one that will be resurrected in the end times. The context of Daniel's succession of world empires as portrayed in chapters 2 and 7 is that the empire of the Antichrist will be a revival of the last of the empires in the series — the Roman Empire. This discussion reminds me of the Holy Roman Empire that existed from about 800 AD to 1806. It was an attempt by Germanic tribes to keep the Roman Empire alive. But it was very limited in scope and existed primarily on paper, prompting Voltaire to observe, "It is neither holy, Roman, nor an empire." Let's take a careful look at the Revelation 17 passage. It begins by referring to the scarlet beast (the Antichrist) on which a great harlot (the Antichrist's apostate religion) sits. It says the beast has seven heads. Considering the time when this passage was written (95 AD), the five kings "fallen" would be the following empires: Egyptian, Assyrian, Babylonian, Medo-Persian, and Grecian. The "one is" empire — the one existing at the time Revelation was written — would be the Roman. The one to come would be the revival of the Roman Empire which will give birth to the Antichrist (the European Union). The eighth empire would be the worldwide empire of the Antichrist which he will establish through military conquest during the first half of the Tribulation. I don't know where the antichrist will come from, but I do know he will make peace where there has been no peace. I have a question regarding Revelation 17:8, what does it mean? (cick on the word "Register" on the top right of the screen to create an account for you to login to download this and a dozen other free ebooks, including one about the timing of the Rapture). You will find it very interesting and provocative to see all the references stacked together! I find myself being irritated by your comments David, that contend your opinions are more accurate than other peoples. Example: I believe all this passage is saying is that the kingdom of the Antichrist will have characteristics of these three kingdoms — swift as a leopard, strong as a bear, and deadly as a lion.' Couldn't it be true, and more probable, that a prophet would use word pictures and descriptions that point to other prophesies, than to just pull something out of the air that is very similar but has nothing to do with the previous prophesy? The beast with 10 horns. 1 nation, 10 kings supporting the Antichrist. Little horn is the Antichrist. Please see www.endtime.com. Out of all the information out there. In my opinion, Irvine Baxter is insightfull and knows his bible as well as his politics. Watch his teachings. They will blow you away.